Public support for legal abortion, while little changed from earlier this year, is as high as it has been in two decades. 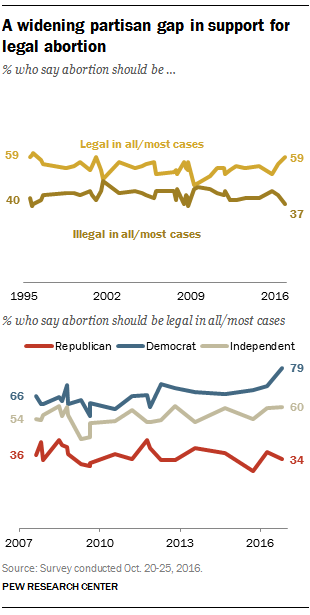 And the share of Democrats saying abortion should be legal in all or most cases has risen since earlier this year – primarily driven by a striking rise in support among Democratic women. A majority of the public says abortion should be legal in all or most cases (59%), while 37% say abortion should be illegal in at least most cases, according to a Pew Research Center survey released last week. Support for legal abortion has fluctuated in recent years, but is at its highest level since 1995. Most Republicans continue to be opposed to legal abortion, and their views have remained relatively stable in recent years. Currently, 62% of Republicans say abortion should be illegal in all or most cases, while 34% think it should be legal in at least most cases. However, the share of Democrats who favor legal abortion has risen 9 percentage points since March, from 70% to 79%. Just 18% of Democrats now say abortion should be illegal in all or most cases. The partisan gap in support for legal abortion, 45 percentage points, is at its widest point in close to a decade. This shift in Democratic support is especially pronounced among women. Currently, 85% of Democratic women think abortion should be legal in all or most cases, up 18 points from March. 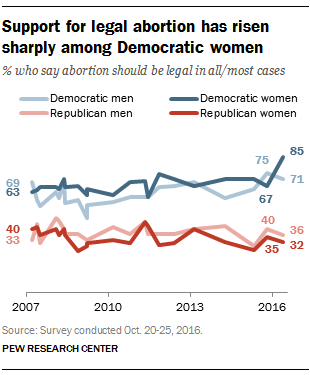 This is the highest level of support for legal abortion among Democratic women in the past two decades. By comparison, 71% of Democratic men say abortion should legal in at least most cases, little changed from March (75%). There are no similar divisions by gender among Republicans. Currently, 36% of Republican men and 32% of Republican women think abortion should be legal in at least most cases. For the most part, there have been only slight gender differences in Republican opinion about abortion over the past decade.